These monstrous brutes serve as the token "tank" enemies in the Fishing Hamlet. 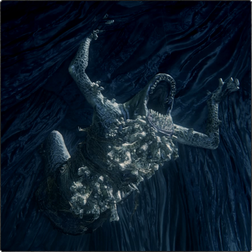 While encountered in only a few locations, they tend to be positioned in spots where they are either not immediately visible or cannot be engaged in combat at all until you've triggered an ambush. 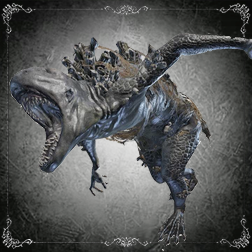 The differences between bare-handed Giant Fishmen and those armed with anchors are significant; the former are generally slow and ponderous enemies with fairly predictable attacks, while the latter have a larger moveset and their actions can be much more difficult to anticipate. Anchor-wielding Giant Fishmen are by far the more dangerous subtype owing to their longer reach, faster attacks and deliberate feints; fortunately, both types can be poisoned with relative ease and are susceptible to standard interrupts and staggers. Do note that while two aesthetic variations of the bare-handed subtype exist, the differences are purely cosmetic and these enemies are in fact identical in every other way. These powerful enemies have large reserves of health and very high defense against physical attacks, but are quite weak to arcane damage; their considerable super armor can be broken with two hits from the Fists of Gratia, but the Beast Roar and most charged attacks are largely ineffective for this purpose. At close range they will attack with quick shoves, slower individual arm slams and combos consisting of up to three hits. They will usually end their combos with either a two-handed overhead slam or a grab attack, though they may abandon the sequence entirely if you back too far away.They will also use two separate variations of the grab on its own: a fast version that strikes directly in front of them at close range and a slow version preceded by several lumbering steps forward. Their other attacks include a slow left-handed uppercut, the two-handed slam by itself and a long-range s ding tackle. The tackle and the faster grab are their most dangerous attacks; the former because it hits multiple times and covers ground quickly, and the latter because it leaves very little time to respond. Despite their great size and strength, these opponents can be set up for visceral attacks by interrupting or staggering them in the usual ways. Before engaging a Giant Fishman, eliminate any weaker enemies in the vicinity if possible. Leaving enough room to maneuver is crucial; backing yourself into a corner while fighting these dangerous opponents will more than likely result in death, as will interference from other Fishmen. Use any available sources of arcane damage such as the Holy Moonlight Sword or A Call Beyond to end the battle quickly and pay careful attention to the enemy's movements for the telegraphs of particular attacks. Provided no other enemies are present, the most effective tactic is to stand just outside the target's melee range and bait any of its slow swings, then strafe backward out of range and interrupt the attack. All variations of the grab can be interrupted, as can the sliding tackle as long as the bullet connects early in the animation - specifically, before the enemy's body hits the ground. The tackle can be avoided by quickstepping either sideways or forward through it; resist the temptation to quickstep backward as doing so will allow the attack to connect. Due to these enemies slow turning speed and generally poor tracking, it is possible to avoid every last one of their melee attacks by standing behind them at pointblank range; strafing sideways is usually enough to hold this position, though an occasional sideways quickstep may also be necessary. Breaking their super armor with the Fists of Gratia will immobilize them long enough to stagger them with a charged strike, and their recovery from knockdown is slow enough that they can be staggered again as they stand up and struck with consecutive visceral attacks. All of their moves except the close-range grab can be reliably avoided by quickstepping forward through the attack which will also position you to perform an (R1) combo from the safety of their blind spot; the grab in question can be thwarted with a single backward quickstep. During Giant Fishman (Fists) grab attack animation, damage can NOT be reduced by repeatedly pressing buttons (mashing). Gnawing Grab (Standing) Yes Close range. Strafe or quickstep backward and try to capitalize on the chance to interrupt it. Sliding Tackle Yes Quickstep left or right, or interrupt it by shooting him at the beginning of the animation before he hits the ground. Uppercut Yes Strafe clockwise around him at pointblank range; otherwise quickstep left or interrupt it. Overhead Slam Yes Quickstep backward out of range or interrupt it near the end of the animation. Beware of the long delay before the slam.